My dash gauge and my dipstick give different readings. Dipstick says full and the gauge says two bars above the fill line. Which is the most reliable? Hands down believe the dipstick over the gauge. On my Boxster the dash gauge and dipstick read the same but on my Carrera the dash gauge constantly changes by 2 to 3 bars +/-. thanks, i thought i was seeing things. ....only after car has been sitting on level ground for THREE days. Otherwise, you will never get an accurate reading. Also, due to the semi-dry sump oil system, flat engine configuration, and huge oil supply, these cars are VERY forgiving of low oil levels. Do NOT worry about being a full quart low. It won't hurt the car. As long as there is oil on the dipstick anywhere, and you have at least one notch on the electronic display, you are absolutely, totally fine. But, if you OVER fill the oil by one notch, bad things happen. Err on the low side on these machines. I know it's hard to believe that, but it's just the way these wacky things work. If you are on a road trip, you CANNOT trust the dip stick or indicator at a gas stop. 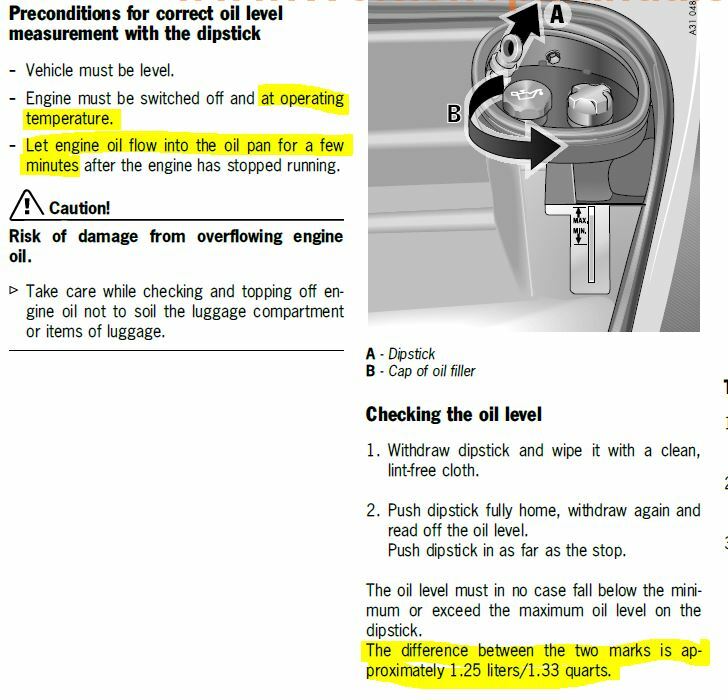 Too many people check their oil at a gas stop, see a low level, and drop in a quart. They end up OVER filling the oil and blowing out the Air/Oil Separator or oil seals. This happened to Car & Driver Magazine, the over filling that is, not blowing out the seals. Resist the temptation. Don't worry, drive happy. On my 2003 S, if I make a short stop, such as for gas, when I turn the key back on there is a countdown timer that starts counting down from 1 hour before the oil level will show. When the car has been sitting for a while, that countdown timer starts at 4 seconds. Sometimes a gas stop is long enough though that turning the key shows the timer starting at 4 seconds. After 13 years, my dash oil level gauge is starting to do a little more of the +/- variability. My indy garage told me that each bar on the gauge was some small fraction of a quart, like 1/10 of one, but I don't recall exactly and have been too lazy to look at the owners manual. I have heard the newer P cars don't have a dipstick. Great advise. Thanks for posting! Last edited by JayG; 01-06-2017 at 07:03 AM. ....After three days, i get an extra line on the electronic display. Again, a little bit low is MUCH better than a little bit too much. this site is a thing of beauty, thanks for sharing your knowledge.